This entry was posted in Vicky's Blog on Mar 9, 2014 by gfbyvickypearl. This entry was posted in Children Connection, Vicky's Blog on Aug 20, 2013 by gfbyvickypearl. 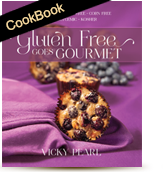 This entry was posted in Oils/Fats on Aug 19, 2013 by gfbyvickypearl. This entry was posted in Flours on Aug 19, 2013 by gfbyvickypearl. This entry was posted in Starches on Aug 19, 2013 by gfbyvickypearl.